After four days up in Chiang Mai and having sent our houseguest Stephanie on her way back to Melbourne, let me return to New Year’s Eve and catch you up on events. New Year’s Eve is a big event here in Thailand. In fact, unlike for many companies in the United States, New Year’s Eve is a statutory holiday here, as is New Year’s Day. Tawn’s extended family, much of which lives in properties adjacent to his parents’, hold a big annual party to ring in the new year. Tawn was there for most of the afternoon, returning home about 11 pm to celebrate the stroke of midnight with Stephanie and me. This left Stephanie and me to our own devices for most of the evening. Instead of venturing out – crowds and the threat of bombs! 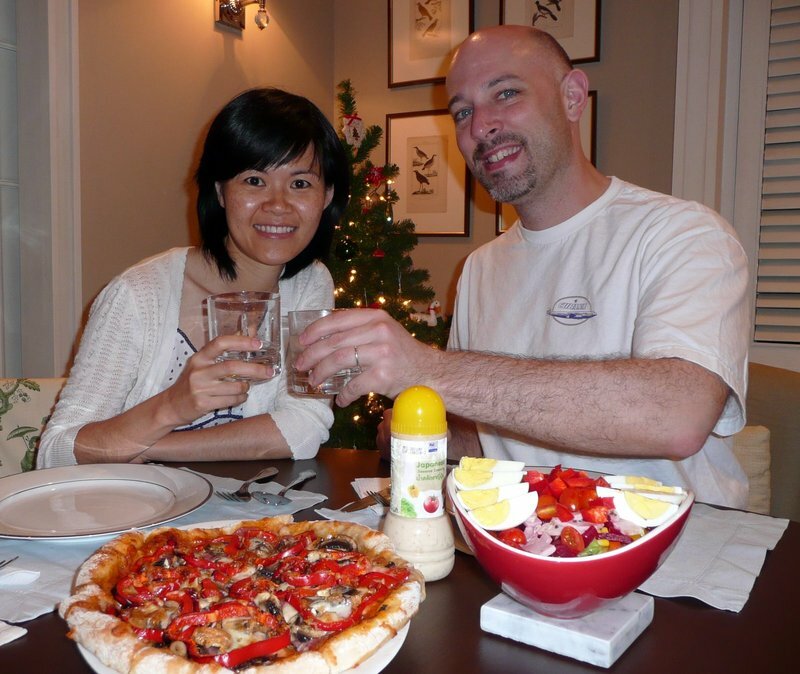 – we stayed at home and had a low-key dinner of homemade pizza, salad and chocolate souffles. 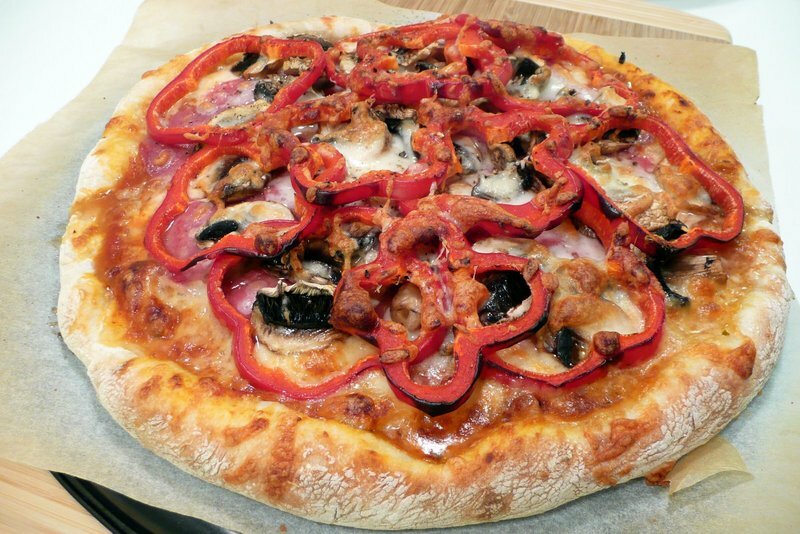 The pizza was pepperoni, mushrooms and red peppers, something simple and satisfying to munch on. 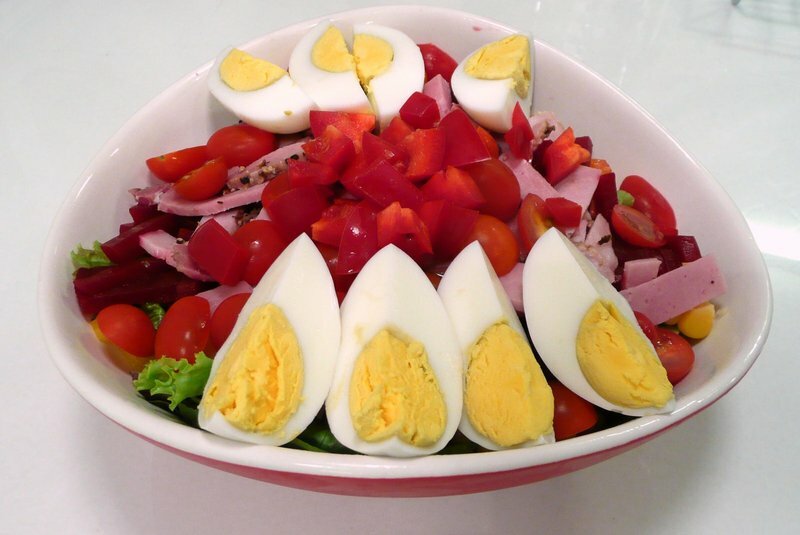 A mixed greens salad with plenty of toppings increased the healthfulness of the meal. Then we took a turn for the cardiac unit (no, wait – chocolate has antioxidants, right?) with the souffles. This was not my first time using this recipe from Cook’s Illustrated Best Make-Ahead Recipes. 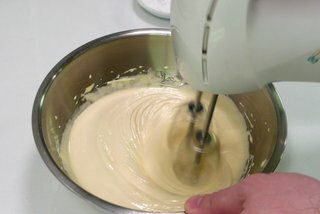 The secret is that you can make souffles in advance, wrap them well (uncooked) then freeze them. Then, when you want a hot souffle all you have to do is take it out of the freezer and slip it into a hot oven. Twenty five minutes later you’ll have dessert on the table. 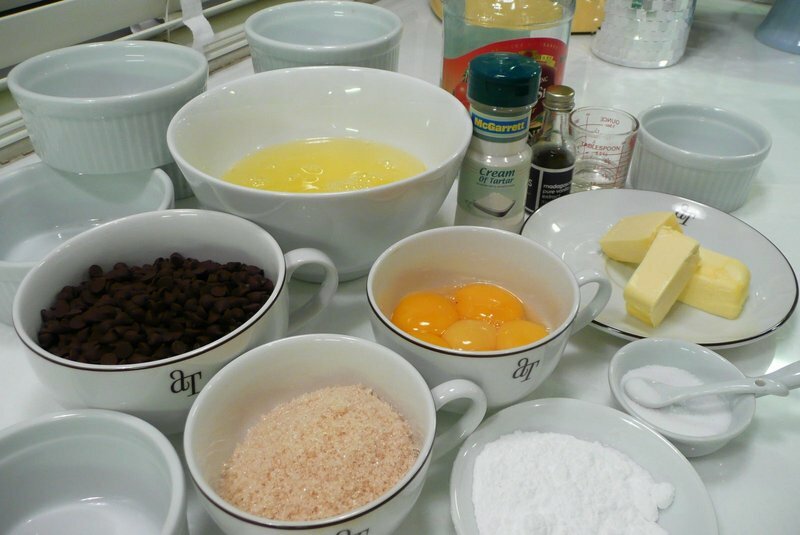 The ingredients: chocolate, confectioner’s sugar and granulated sugar, egg yolks, egg whites, cream of tartar, salt, vanilla and a bit of orange liqueur. 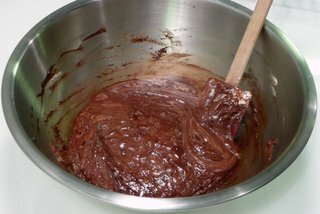 Melt the chocolate and butter in a bowl set over simmering water. Beat the egg yolks into the granulated sugar. 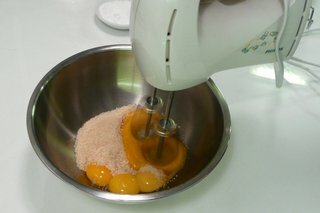 Continue whipping the yolks and sugar until the mixture triples in volume. 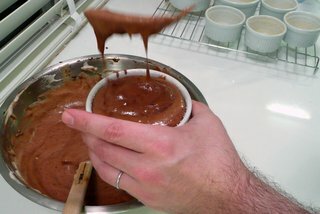 Gentle fold the chocolate and egg mixture together until just incorporated. 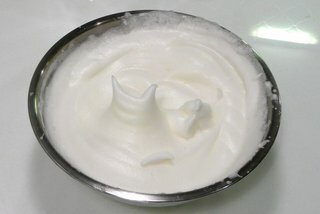 Whip the egg whites, adding a bit of cream of tartar and then a bit of confectioner’s sugar, until they form stiff peaks. 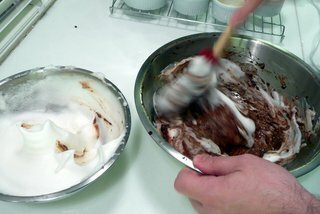 Gently fold the egg whites into the chocolate mixture until mixed, being careful not to deflate. Spoon into ramekins that have been buttered and sprinkled with granulated sugar. Fill to the top and then cover with plastic wrap and then foil. Refrigerate for up to three hours or freeze. When ready, remove the wrappings and bake on a tray in the oven for about 25 minutes or until the interior is still slightly soft. 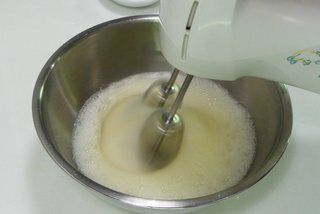 Remove and dust with confectioner’s sugar. Some berries or a berry sauce are nice, too! Above, Stephanie and I toast our New Year’s Eve dinner. Would have been nice to have Tawn home with us, but he was back in time for the fireworks. While it is a bit more than a week late, let me wish you all the very best for 2010. May each of you enjoy good health, great happiness and boundless peace. Happy New Year back to you and Tawn. Your souffles look great. Good job! The soufflés look so good! Happy New Year! “Chocolates has antioxidants” My selective reading has filtered out the rest and retained just the essential bit of information. Oh yeah – the pizza looks very good. Happy New Year to both of you. The souffles look very professional Chris. I am sorry you weren’t able to go with Tawn and enjoy the evening with his relatives. But the pizza and the salad and the dessert made up for that it seems. 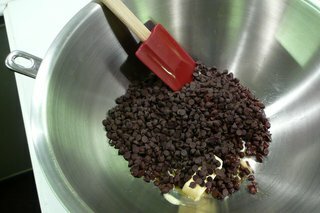 @ElusiveWords – chocolate has antioxidants…. until it gets mixed up with sugar and the rest of the “good things”. How’s that for the rain on your parade??? BTW Mattie! I made the fried rice last night ( your recipe ), instead of pork I used lamb and shrimp. It was excellent, every one said. I have no left overs. It truly must have been good. I liked it a lot. @ZSA_MD – oh, I’m glad everyone liked the fried rice. There were also comments by Arenadi (Mike) that should be incorporated as well into the overall recipe (e.g. refrigerating the rice). There’s also another version in restaurants that use a bit of salted preserved fish and small bits of chicken. I’ve yet to try making that version. The food as always is beautiful and I’m sure it tasted and smelled even better. Hope 2010 is treating you right as well! Chris, I guess you can publish your own cookbook very soon. Those souffles look very very good indeed! Can you make some when we pay you a visit? =pHappy 2010! @CurryPuffy – If I publish a cookbook I’m going to be running into heaps of copyright violations! But, yes, let’s have a dinner at home on the next visit. It would be lots of fun to cook together and I’m sure my food would benefit from W’s photography. Actually, my food would probably benefit from W’s cooking, too! LOL@TheCheshireGrins – Finding out that you can make them in advance was the best news I’ve received in a long time, cooking-wise. 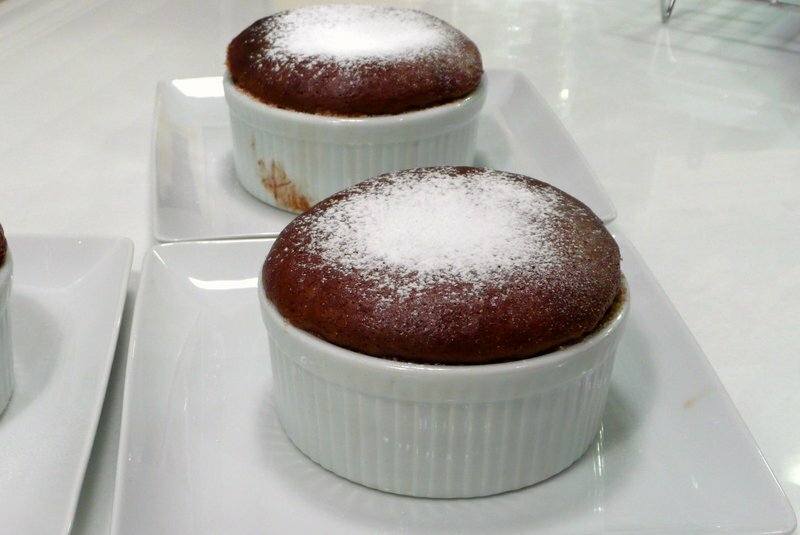 @murisopsis – @Dezinerdreams – Actually, don’t tell anyone, the souffles were quite underdone when we took them out so decided to put them back in for a few minutes. Of course, that never works much better so despite them being pretty, they were overcooked on the outside… bleh! @ZSA_MD – I’ve written before about the tension that exists between me and my father-in-law or, more accurately, between him and the reality that his son is gay, so I didn’t go into that in this entry. As I meet and connect with more of Tawn’s cousins, though, it is clear that the next generation will be much more welcoming. In fact, I rec’d several invitations but had to turn them down because I don’t want to cause friction with my father-in-law. @ElusiveWords – Selective reading is good for you, right? Happy new year to you and your bf, too. @stebow – Thank you, wish we could have been in Newark to celebrate. Will be there in the first half of March, though. @yang1815 – To you, too. Hope you and Sugi had a good celebration. Liked reading about the tiger sanuary (link from you posted with ZSA) and decided to read about your New Year’s Pizza. One question comes to mind, what kinds of cheese is available in Thailand? I suppose it is expensive in Thailand? @PPhilip – Glad you liked the tiger sanctuary link. As for cheese, almost every type is available with a little hunting but the issue is really cost. At my local “western” supermarket there are probably forty different types of cheese but even a smallish block of mozzarella (produced in Australia) will run me US$5. If I want any of the good stuff it will cost more. Both the pizza and the souffles look wonderful. I picked up the make-aheads as well, and thought many of the recipes in that volume were ingenious and want to try them. I like the fact that you can prepare this souffle in advance so that you don’t have to get up and make a souffle at the end of dinner and leave your guests, and instead just take them out of the refrigerator and pop them in the oven.I’m curious though, what recipe did you use for your pizza? @arenadi – There is a make ahead pizza dough recipe in the “Kneadlessly Simple” bread book. I use that most of the time but often add more whole grain flour. There are always a few discs wrapped tightly and sitting in the freezer for future use. @Casa_blanca_lilies – Thanks – very nice of you to say. Actually, though, they were a bit undercooked inside at first. 2 of my favorite food! @doiturselfer – Ah ha! My plan was a success!